How do you put on and take off your Opera Bracelet? Opera Bracelets are made using memory wire, so they expand when put on and then spring back to their original shape, which allows Opera Bracelets to fit nearly anyone! Also, there are no clasps required for a memory wire bracelet, so you can put it on yourself without assistance from anyone else. What materials are used in Opera Bracelets? Opera Bracelets are created from stainless steel memory wire, glass, pewter and ceramic beads with pewter charms. The pewter charms I use are made in the USA. The glass beads used mainly come from the Czech Republic, where they have specialized in making glass beads for over 200 years. Some crystals come from Austria. Metal Cloisonné beads come from China where they have been an art form since the 1300's. Please Note: Opera Bracelets contain small delicate parts and are not intended for children. A note about jewelry materials: Metals and glass finishes can react with the oils of your skin and anything you put on your skin, such as soaps, perfumes or lotions, so please do not wear your Opera Bracelet when applying these. Also, do not wear the jewelry when swimming, doing heavy exercise, etc. Charms and other elements can catch on fine knitwear, so please wear with care! Glass beads, while normally very durable, can still break in certain circumstances; after all they are still glass. If you ever have a broken bead, please contact me so I can fix the bracelet for you right away at no charge! I stand behind my work 100% and always want you to be happy with your Opera Bracelet. Do Opera Bracelets make noise when worn? Opera Bracelets are quiet when they are being worn, even in an opera or theater setting. People have asked about this to be sure they will not disturb their neighbor at the theater with their favorite Opera Bracelet on their wrist! What will the package look like when it arrives? 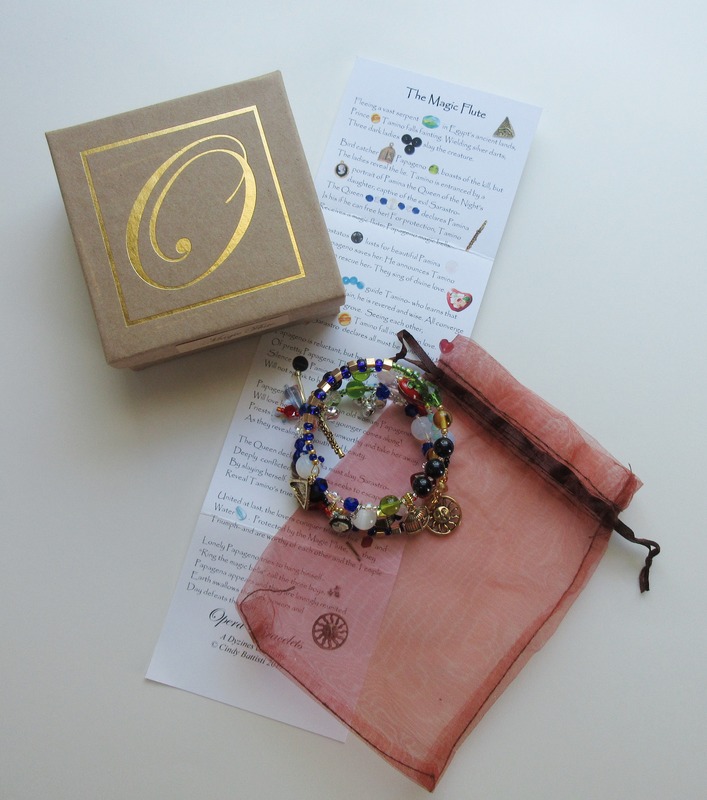 Opera Bracelets arrive in a drawstring organza bag, within a gift box that also contains the associated synopsis bead chart for "Full Story" Opera Bracelets or explanatory card for "Inspired By..." Bracelets. When will my Opera Bracelets ship? All Opera Bracelets are individually handmade in Rochester, NY and ordinarily ship within 2-3 business days. If there should be any delay beyond this, you will be contacted via email and all efforts will be made to get your Opera Bracelets to you as soon as possible. Do you do all this yourself? Yes, mainly. My husband Andrew is the Marketing Director, Webmaster and Financial Manager of Opera Bracelets. I recently brought on a Social Media Consultant and I occasionally get help with assembling the treat bags that go into all the orders that ship out. I make most bracelets myself but when I cant keep up, my friends help me out. These are talented creatives in the USA. I have no plans to farm out assembly to low cost producers in other countries (even though so many suggest it). Well that's kind of a story! Click here to learn about the how the idea for Opera Bracelets started. Do you have Wholesale/Quantity Pricing? Why is the charge on my credit card listed as Dyzines and not as Opera Bracelets? Dyzines is my corporate business name as recorded by New York State (where I live). When I started Opera Bracelets, I still had a suite of artistic businesses, so I included Opera Bracelets under the Dyzines name for both legal and financial simplicity. If you have any other questions not listed here, please contact me at cindy@operabracelets.com or call me at 585-271-0864 between 10 am and 7 pm ET Mon-Sat.